There’s something extremely satisfying about fresh-baked goods and when they are prepared with that homemade touch. At Acquistapace’s you’ll find cookies, brownies, muffins, cupcakes, croissants and petit fours straight from our kitchen. 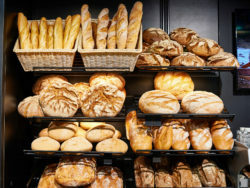 Ready to make that next Po-boy – Acquistapace’s understands that sentiment and knows fresh French bread is essential, so daily you’ll find fresh-baked white and wheat French bread at our store, along with Kaiser rolls and pistolettes.